Today’s Sustainable Safety policies demand a type of street design that is completely different from what was actually built in the 1960s, also in the Netherlands. So can you re-design streets that were built in a time when the car got all the space it needed, and more? Can you change those streets to meet the objectives of today’s safety and traffic management policies? And can it be done within reasonable budgets? Well, yes, Utrecht proves that it is possible! Utrecht Overvecht was designed around the car in the 1960s. The streets are incredibly wide and gave motor traffic a free reign in the area. But things are changing! (Picture Bing Maps). 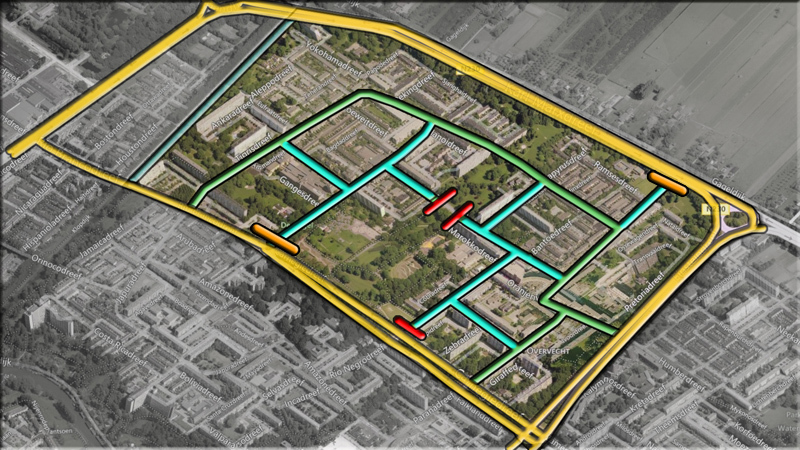 As part of a much larger plan to redevelop a 1960s housing estate in Utrecht, the street grid in this neighbourhood called ‘Overvecht’ will be completely updated to the 21st century Dutch standards. The new street grid will make the area safer, more attractive and more liveable. The city achieves this by concentrating the main motor traffic flow better and in fewer designated streets and by changing many other streets into 30km/h (19mph) zones to give more and a safer space to people walking and cycling. The plans are currently executed and a number of former main streets was already narrowed to exactly half their original 1960s width. In this post I zoom in on the north-west quadrant of the neighbourhood that houses about 10,000 people. The changes to the original 1960s grid. In yellow the city’s main arterial roads. In blue the streets that were main streets that now became residential streets. In green the new ‘neighbourhood ring’. The red lines are blockades and the orange lines are planned blockades that have not (yet) been implemented. In the original 1960s street grid for this area, motor traffic was able to use all streets to get from one end to the other. Some streets were even wider than others and served as through street. Most streets were purely residential, but all streets had the same speed limit of 50km/h (31mph). 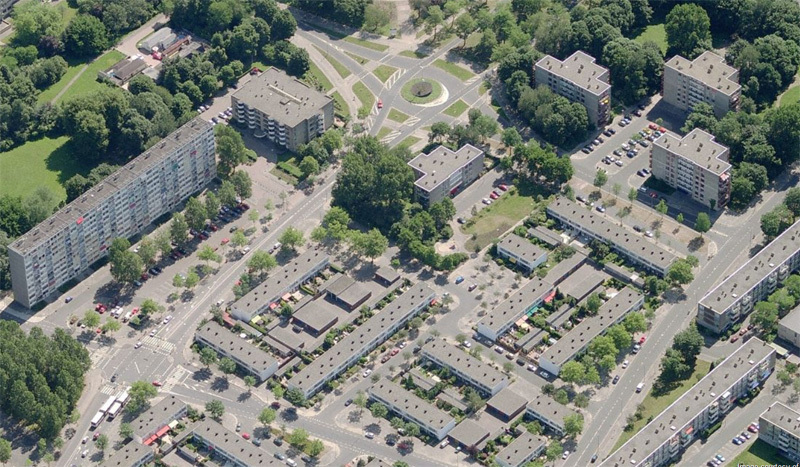 To channel the traffic flow better, the city designated a so-called ‘neighbourhood ring’. This is the street that is designed to give quick access from the city’s arterial roads to the purely residential streets. The latter type of streets have all become 30km/h (19mph) streets. This means that no 30km/h street has a direct access to an arterial road, but that traffic is forced to use the neighbourhood ring to get to the main arteries via only very few access points. The neighbourhood ring is not for through traffic, it will only be used by motor traffic that has to be in the area. That means the traffic volume is still relatively low and the streets forming the ring do not have to be widened to handle the traffic that previously used other streets in the area. On the contrary: the 1960s design was so wide that the ring has to be optically narrowed. 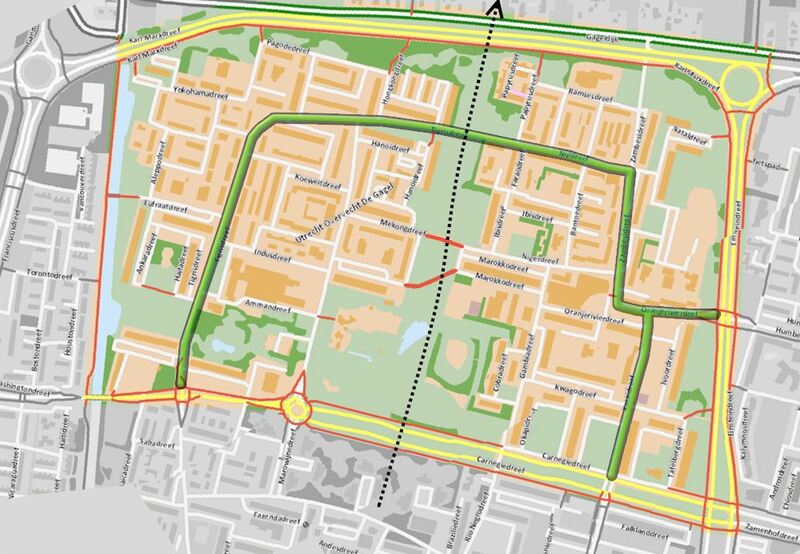 This will be done by removing the centre line and by implementing cycle lanes. Since the ring is not for through traffic and the speed limit is 50km/h, separated cycle tracks are not necessary. But the ring is also a bus route, so there are a number of bus stops. 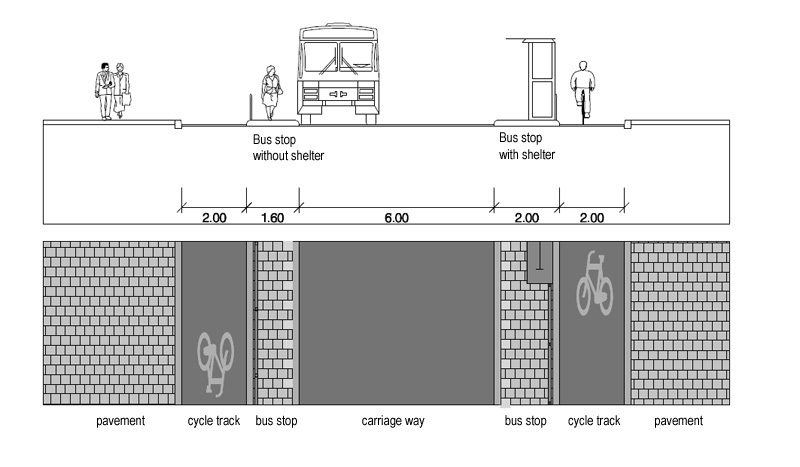 For safety reasons separated cycle tracks will be built around all bus stops in the ring. The street is still wide enough for lorries that need to be in the area to transport goods to the shops for instance. Under Dutch regulations lorries up to 17.27 metres long should be able to enter the area and they can. Emergency services are not restricted to the few access points, they can also use the cycle short-cuts in case of an emergency. Safety for cyclists and pedestrians improves in the area because motor traffic will be concentrated in a street designed to handle that traffic. All the other streets will become less busy and the speeds in residential streets were already lowered to 30km/h. This eliminates most of the speed differences. The area has always had a high number of short cuts for cyclists. You can enter the neighbourhood in 20 places if you cycle and the (future) through routes for cycling are now even further from the main motor traffic flow. The cycle routes are almost always shorter than the routes for motor traffic. For people cycling the neighbourhood is much better accessible. All the red lines are separate cycle paths and short cuts. The latter can also be used by emergency services but not by normal motor traffic. The black dotted line represents a proposed new main cycle route completely away from motor traffic. Not all the residents were in favour of every aspect of this plan. Some feared that forcing motor traffic to use the neighbourhood ring would lead to longer routes and so more exhaust fumes. But the city said that investigations show that the relocation of motor traffic does not lead to more environmental problems. The longer routes for some residents are evened out by the reduction of through traffic that now will stay out of the neighbourhood completely. The original main streets that were to become small residential streets were literally cut in half. The old asphalt remained and the centre line was scraped off. The removed half was redesigned with mostly widened pavements (side walks) and a green area. To get through motor traffic out of these streets the street itself has to signal the message that it is no longer a through street. Only putting up a sign that the speed limit was lowered would not have been enough. Just asking people to be nice and drive slower is pretty much pointless. So apart from narrowing many streets, some strategically chosen streets were also blocked, so they could not physically be used for through traffic any longer either. Finally, all the priority signs and indications were removed. In a 30km/h zone there are no main streets that have priority over side streets. All streets are equal and the basic priority rule is valid: traffic from the right has the right of way. This forces motor traffic to approach every side street with care and in a low speed. In one of the former main streets that was supposed to be blocked, the residents were against the closure in such a large majority that the city decided to reverse that decision. The street did become a 30km/h zone, but with a direct access to a main arterial road (number 4 on the map above). This is in conflict with the rule that no 30km/h street has access to a main artery, but these exceptions to plans will always be there in reality. 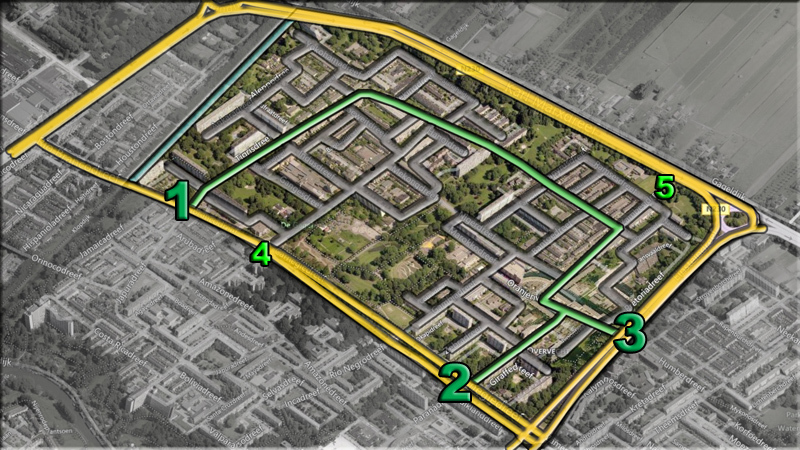 There is still debate to close the access to the city ring road (number 5 on the map above). This provincial road may be changed to a state motor way and the city really wants to close this (half) access. The final decision will depend on what that road will look like in the future. With these modifications to the original 1960s design the streets in this part of the city are again up to the latest standards of road safety and design and they are ready for their next 50 years. Video explaining the modernisation of this neighbourhood’s street grid. Did all of the proposed blockades make it through? You could literally uplift this and translate it to Manukau City Centre and its immediate surrounds. Will follow up on Manukau, Transform Manukau in a subsequent post. Could you expand on this? What were the objections? Was not something temporary tried? Great documentation on transportation. Good work. Pingback: On Building Bike Lanes Faster… – Let's Go Biking! The work of Bicycledutch is fantastic. Thanks for doing what you do. I have a few small questions: This appears to be very precisely focused on making cars safer around bikes and pedestrians but seems to have no intention of eliminating cars, as some cities have lately vowed to do. Does CarFree fit into Utrecht’s plans any time in the future? Also, if the emphasis is on making cars safer, are there any courses or programs to focus on safer driving? I’m seeing this from outside, so my observations will be unclear. 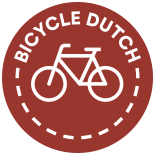 Are there any group bike rides or cycling events in the Netherlands? I heard about a velomobile summit but nothing else. Portland, Oregon, is famous for hosting hundreds of grass roots generated bike rides with a variety of themes. I never hear of this in the Netherlands and thought I should ask. Hi Doug, this has everything to do with eliminating the number of cars in this area. It is traffic calmed to a high degree by only making this area accessible for people who really live here. That decreases the volume very much. What this design also does is eliminate speed. By doing that it makes the car less dangerous. We are not anti-car in The Netherlands, even in Houten, the most bicycle friendly town in the country, every single home is perfectly accessible by car. It is just not the most convenient mode of travel and that is why people choose the bicycle. And they do so in such masses that there is no need for organised bike rides. Foreign observers often tell me that the rush hours in this country look to them as if they are organised bike rides. That’s how many people ride. We have a mass bike ride every day. Car free city centres do not have to be planned in the Netherlands because there are almost no cities that do not have a car free city centre already and for a very long time. Utrecht’s car free area is 50 years old. It is interesting that the residents of the area had some of the same remarks my readers make. The city published both the remarks of the residents as well as the answers on the internet (only in Dutch of course) so I can cite from there. The option to build separated cycle tracks along the entire neighbourhood ring will indeed be too expensive and really isn’t necessary. With the low traffic volume and the maximum speed of 50km/h, the cycle lanes combined with the removal of the center line and the removal of parking spaces along that neighbourhood ring, are really enough. Saving existing trees was also specifically mentioned as something to aspire to. I have an aside. The aerial view at the top (a drawing) shows the rooftops as they were originally designed, with no greens. It appears to be as much total area as the amount of road space. That’s a lot of space that could become urban farms and gardens. In the new street design for the neighbourhood ring, the cycling provision is merely lanes on the road, except at bus stops where it turns into a cycle path and passes behind the stop. If there’s enough room for this, why weren’t cycle paths provided along the whole length? Even though the speed and volume of motor traffic is low, as the road is used by buses surely it’s going to be uncomfortable, especially for small children, being passed by a bus? Maybe in the Netherlands bus drivers are used to people on bikes in a way that they aren’t here in Britain. But on-carriageway cycle lanes seems an odd choice to make when the space is there for a cycle path. First, it’s not just about the available space. The new layout will fit the profile of the old road, which means that trees, drainage, sewer pipes, lamp posts, cables, et cetera can mostly remain on their original position. To create a layout with cycle paths, the operation might be far more expensive. I would be curious to know if a street with cycle paths would also lead to more speeding and a worse overall experience. However, using cycle lanes (and cyclists!) as traffic calming somehow seems wrong. Thanks for sharing the information and insightful visuals about this project! I posted a link on my blog. Your article shows how rebuilding streets looks when finished. – On a junction without priority for one road, traffic (including cyclists, excluding pedestrians) from the right has right of way. – On any junction, traffic from both directions (including pedestrians!) continuing on the same road has has right of way over turning traffic. – Turning right has right of way over turning left into the same road. – Through-routes are usually assigned priority over smaller streets. – All traffic (including pedestrians) have right of way over traffic leaving an exit/driveway. – Almost all roundabouts (with some notable weird exceptions) have priority over the roads leading into them. There are 2 styles of roundabouts: smaller ones, where the cyclists are part of the roundabout and have priority, and larger ones, where the bike paths cross the roads at some distance from the roundabout, without priority. but what about changes to the streetscape in areas where the build is not relatively modern and there is a great deal less combined road/pavement space? This can be done in old and new neighbourhoods. It is very common all over the Netherlands that cities close streets for motor traffic so the flow of traffic is diverted around certain areas. More information in this post. This is really very helpful for us in Australia. Practically all of our residential streets are like these used to be – wide through-routes with 50km/h limits. This shows how relatively easy it is to change that and how segregation without cycle paths works on slow speed streets. You explained the benefits quite well (making this a safer and more convenient place to walk and bike through) but did you explain what the issues were, or what the impetus was to change the neighborhood street infrastructure? Maybe not so clear, but the reason is in the first sentence: the ‘sustainable safety’ policies demand that all streets in the Netherlands are designed for their purpose. These streets were clearly not so they had to be changed. The city took the opportunity to do this in a much bigger plan to update and improve the entire area. In that case it’s good we cleared it up: other people may also not have understood. Here it is a reason to act. When streets do not comply with standards they will be changed sooner or later. We have construction/geometry standards, but rarely do we apply function/livability standards. That is slowly changing with the “complete streets” movement, but that legislation (enacted at state, county, and city levels) does have specific design requirements, only that streets be designed to consider more than the automobile. And the problem with Complete Streets is that a lot of it is dependent on federal funding (my understanding is, essentially, that Complete Streets is, at a federal level, simply a grant program for municipalities and such that implement streets with some form of cycling and pedestrian infrastructure, when adding or refurbishing streets). And, federal funding for anything that isn’t car infrastructure is under constant attack. Also, it’s my understanding that Complete Streets funding only pays for the construction, and not the maintenance. This leads to paint without physical segregation being preferred by many American cyclists (well, the ones that aren’t arguing that bike lanes should be banned, everyone should take the car lane, because clearly bike lanes are just meant to get people out of the way of cars (which, in the US, might actually be true in some cases)), because a painted bike lane that is the same surface as the rest of the road gets to pick up the scraps from the automotive road maintenance (occasional pothole repair, it benefits when the road is resurfaced, maybe if you’re really lucky it gets street cleaning or snow plowed (hahahahaha no, that never actually happens, actually a segregated lane has an advantage here, that it can’t get the street sweepings blown into it or the snow plowed into it)). Under the American system, except in the very highest cycling modal share cities, a segregated lane often gets left unmaintained, or minimally maintained. The main MUP (which is intended as recreational, and therefore is under the parks department, not transportation, but it happens to be useful for transportation as well) in my city is actually getting maintained now, though, with the county parks department finally getting a property tax levy passed (and running on more than donations) for the first time in 20 years. Mind you, a design to force through car traffic to actual arterials, rather than cutting through residential areas, would be cheap – bollards and signs alone could do it. There’s even a couple areas in my city that I can think of right now, that with some bollards, signs, and careful application of stop signs and/or simple conditional yield signs (to make cyclists have right-of-way by default in that area, if it can be legally implemented), you could make halfway decent cycle arterials out of the existing car infrastructure in neighborhoods, and closely paralleling the car arterials (only a block away – obviously very far away by Dutch standards, but a block away would be better than most distances to get to cycling infrastructure in my area (especially the north-to-south infrastructure, of which I only know two routes), and would be much cheaper and politically possible). The other problem is when the residential areas are newer, though, and were designed as winding roads to nowhere between arterials, to interrupt through car traffic, without going for the simpler, more forceful route of bollards to allow cyclists through. Hmm… now I’m considering doing videos of the cycling infrastructure in my area, as well as things like my commute, and riding to various destinations (restaurants, grocery store, that sort of thing). This entry was posted on 8 August 2013 by Bicycle Dutch in Original posts and tagged filtered permeability, history, infrastructure, livable cities, policies, urban planning, Utrecht.